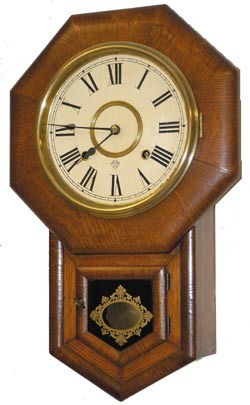 Ansonia Clock Co. "Drop Octagon-R.C, 8 Inch", C. 1901. What a fine rosewood veneer case, refinished some time ago, but just outstanding deep rich color. No veneer loss, but a chigger bite on a corner and a tiny scrape, hauling here no doubt. It would probably cover over if I would take the time. 8 day movement strikes hours on a coil gong. The paper dial is a recent addition, a nice installation, and looks great. Two fine glasses, two like new labels, old brass bob, bezel and rings polished and sure look good with this great rosewood case. The movement is also shiny clean, running strong. Ly-Ansonia #665.